Well, my fellow LOSTIES, there's only one word I can think of to describe the most anticipated episode of Season 5, one we've anticipated ever since we got the name of it back in the fall of 2008. That word would be.......wait for it....... WOW!!!!!! Yeah yeah yeah, I know, I say that about every episode. But, I think you all would be upset if I stopped doing it. So consider it my ongoing trademark! The Life and Death of Jeremy Bentham accomplished exactly what it set out to do. But it didn't stop there! We kinda assumed Locke would hit roadblocks on his off-Island journey. But we didn't know who he might run into, the information that would be divulged on his venture. Oh, and the way they kept the ISLAND as part of the episode was simply fantastic. I must agree that the producers picked the right order for these 2 episodes (316 and The Life and Death of Jeremy Bentham were written simultaneously and supposedly could air in either order). I'm excited to see where this story goes from here. But before we begin speculating, we must recap what we learned in this fabulous episode! Here goes nothing! 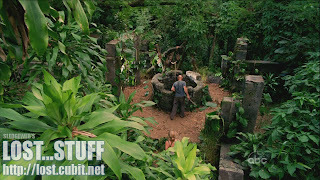 When we last left Locke (alive), we saw him turn the crazy "unfrozen" donkey wheel which transported himself off the Island. The last time we saw Locke in the PRESENT DAY (Oceanic 6 timeline) was in a coffin being prepared to board Ajira Flight 316 - Destination ISLAND! 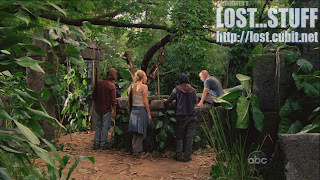 Last week, we only saw Jack, Kate and Hurley return to the Island in what appeared to be in the DHARMA Past where they ran into Jin in a DHARMA Jumpsuit. DUM DUM DUMMMMMMM! (Don't worry, we'll get to them at a later date!) How about everyone else? Where/When did THEY end up? Let's dive in and find out! We are fooled for a minute or two with our new characters Caesar and Ilana. (introduced on Flight 316 briefly last week. 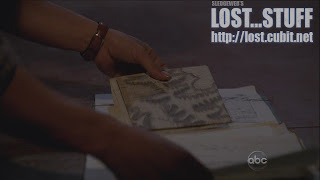 Caesar expressed condolences to Jack about his friend's (Locke's) death and Ilana had Sayid in custody) Caesar was looking around someone's office, finding maps of the Island and Guns and Flashlights. 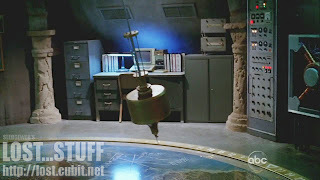 But it is not long before we find out that this is after Flight 316 left Los Angeles and we're back in Island territory! 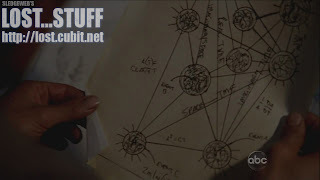 Caesar finds a page from Daniel Faraday's journal and the map of the Island he had in season 4. Also found with these pages is Rousseau's Map of the Island which Sayid snatched from her in season 1 and used in season 2 for his boating expedition around the Island. (I can't take credit for these observations. It's all Sledgeweb) Somehow all of these materials end up at the Hydra Station at some point in time. (AKA the smaller Island next to THE Island and what I like to call Alcatraz 2.0!) We'll get to that in a second. Have we seen Daniel's drawing below before? 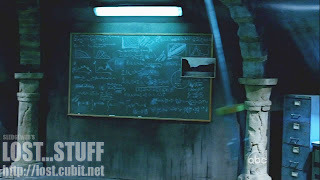 Could these be the unique pockets of energy that his mother explained to Jack, Ben, Desmond and Sun? Caesar quickly flips through an old Life Magazine from 1954 that has a H-Bomb explosion on the cover. Perhaps Richard grabbed a copy during his travels to see the birth of John Locke? I'm sure in the vast spectrum of answers we're looking to get, this falls at the bottom of the priority list! Just a little Easter Egg in the show. For all we know, the OTHERS or someone was doing research on their 1954 visitors. 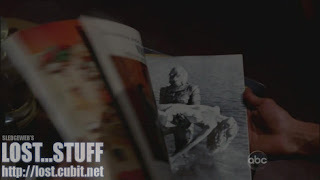 Also when he's flipping through the magazine we get a quick snippet from what appears to the "The Creature from the Black Lagoon." 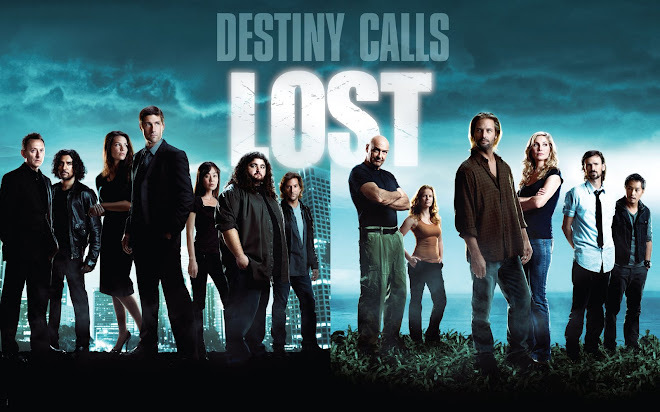 Don't know much about the story, but with an expedition team sent to the Amazon Jungle and monsters killing people and stuff, you could probably make some ties to LOST! Caesar finds a gun while he's looking around. When Ilana comes into the office, he doesn't show it to her. He gives her the flashlight instead. This dude just looks like he's there for maniacal reasons (which, it's tough to know if we should stay under that impression. We used to think JIN was a bad dude afterall!) But something at least to keep in the back of your mind. Why did he take the gun? Ilana informs Caesar that they found a man standing in the water and that he wasn't on the plane. Caesar makes reference to people that "disappeared" but we'll get more into that later. They then pass by the Ajira plane which appears to have veered off of a "RUNWAY!" Man, I love it when our speculation turns out to be dead on! Here's a refresher. 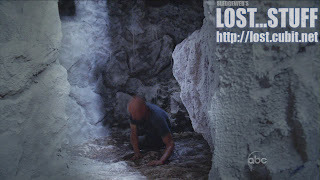 When Sawyer and Kate were kidnapped by The Others and lived in cages for the grueling first 6 episodes of season 3, they were put to work breaking rocks. At the end of season 3, Sawyer asks Juliet what they were building anyway. Juliet says "a runway." She jokes "for the aliens" but we knew it would come in handy at some point. Perhaps Future Locke or Jacob (unless it's the same thing) instructs Ben or Richard or someone to begin construction of this runway because they knew they were going to need it to land this plane? And way to go Frank Lapidus on another excellent landing on/near the Island! 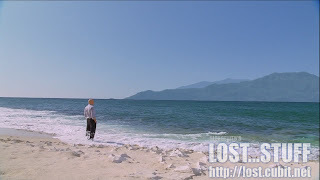 Anyway, it is revealed that this man that was standing in the water is none other than John Locke! REBORN! Okay, so he is resurrected. This show has officially crossed into some new territory. First we had ghosts which could've been dismissed as visions or apparitions of the smoke monster. 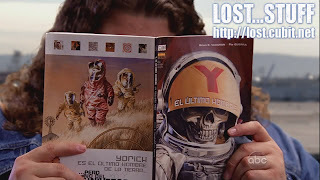 This season we have time traveling LOSTIES and Resurrecting Losties! But before we get too crazy. IS he alive again? Or is he the same kind of "ALIVE" as Christian Shephard, who SEEMS very much alive. He held Aaron but also disappeared when Jack got too close to him. And he "appeared" OFF-Island to Jack too and disappeared. It would seem to me that everyone is seeing Locke and able to interact with him. And come on...Locke ate a mango and loved it! There is something NEW going on here. The next morning Ilana talks to Locke (you know..the Mango eating scene!) and John stares at his beloved Island. This is where we can confirm we're on the Hydra Island. Locke is very up-front with them that he is confused to how he ended up there. Okay, so it's confirmed. 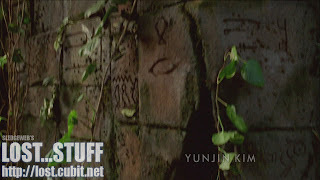 Some people are in the present day from Flight 316, and others ended up in the DHARMA Past. I'm surprised that in the poll on the site, the majority assumed they'd be in the same time period! So did they really separate Sun and Jin through time? I guess that would make sense to still create some drama about them reuniting. Not sure I can think of what OTHER woman would just hop on a boat with Frank Lapidus, unless it's one of the flight attendants! I guess we can also assume these boats were the OTHERS' boats? Which I'm not sure why Juliet wouldn't recognize them unless because it was 3 years in the future. And that these new castaways were the ones shooting at our original castaways a few episodes back. I'm sure we will see this all play out! Another note, it seems like a day or 2 have passed before Locke showed up in the water. I guess you could make more Christian ties to this with the 3 days before the resurrection. But, I'd kinda like to know where he has been and what happened to him! Anyway, Locke says he remembers a lot of things, but doesn't remember the plane. And explains that the suit he was wearing (along with Christian's shoes that are on the beach now) was probably what he was intended to be buried in. He told Ilana that he remembered dying. CUE FLASHBACK! We learn that Locke ends up in the same exact location that Ben did a couple years back. Except, Locke traveled 3 years into the future when Ben only traveled about 10 months. From Locke's perspective, it was only really a 4-6 since Ben left. But we're getting ahead of ourselves. Locke shows up laying on the ground and still in much pain from the bone sticking out of his knee! He cries out for help for a long time. Night falls, and finally a pickup truck runs right up to him. We see very familiar Middle-Eastern folk come and get Locke and put him in a truck. Locke is rushed to some kind of medical facility. We see Matthew Abbadon there watching over the whole scene. A doctor resets Locke's leg. Locke passes out. Very suspenseful stuff and very painful to watch! But the meat of this story happens after Locke wakes up. Who is there to great him but none other than Charles Widmore! Widmore explains that he had a specialist flown in to reset his leg properly. "It's nice to see you again John" Widmore hasn't seen Locke since 1954 on the Island. (when Widmore was 17) And he is amazed that it's only been about 4 days from Locke's perspective. Locke doesn't seem to recognize Widmore even though he saw Ben's video of him last season. Oh well, we'll let it slide! 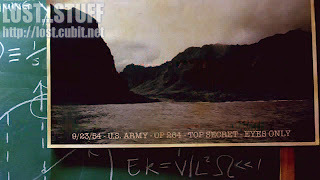 We find out that the camera was planted by Widmore because he knew that was the "EXIT" from the Island. Interesting using the term Exit, and I'm sure much can be theorized on it. But I'm going to keep going! So here's the big question, OLD Widmore remembers his encounter with Locke in 1954, but WHEN did he remember it? We'll discuss later in this recap that plans were set in action in order to bring Locke to the Island. Was this because he already knew he had to go there? Or did Charles just suddenly get the memory 4 days ago, which is why he planted the camera in the desert? We know Desmond didn't remember his encounter with Faraday in the past until it happened from Faraday's perspective. Same with the reverse when Desmond went to talk to Dan at Oxford in 1996. But we also know that Desmond is "uniquely special" so who knows??? Ugh, even in an episode with barely any time travel I still can't get my head around it all! Charles explains that he was afraid Ben might fool Locke into leaving the Island. He claims that Ben exiled Widmore after he was leader of the others for over 30 years (he called them "his people"). They had a reign of peace for 30 years he claims. By the way, I sooooooo called that Widmore was the leader of the others at one point! Not that anyone will remember that I did, and I'm too lazy to reference the old blog post! Here's the thing though, I assumed that Widmore was the one that ordered the DHARMA Purge, since Ben was not the leader yet. Or was that right around when Ben fooled Charles into turning that wheel? I don't think Widmore was the LEADER at 17 on the Island. The purge happened in 1992-1993 (since Goodspeed mentions he was dead for 12 years to Locke in a dream). So 30 years before that would be 1962/1963ish. Widmore would be in his 20's. Hmmm wait a second...maybe Penny was born on the Island too? Who is her mother!!? 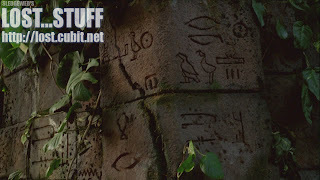 Here's where we speculate again that maybe Charles and Eloise were an ITEM on the Island. And that perhaps Dan and Penny are siblings separated at birth. Interesting theory. I thought I found plot holes in it before, but I can't think of them right now! Widmore explains that the C4 and the freighter were all ploys to get rid of Ben and clear the way for Locke to lead on the Island. Great things are expected of him. Locke explains how he needs to bring the people that left back. And Widmore offers his help. He also claims that he is watching over all of the Oceanic 6. So now both Ben AND Widmore were keeping tabs on them. 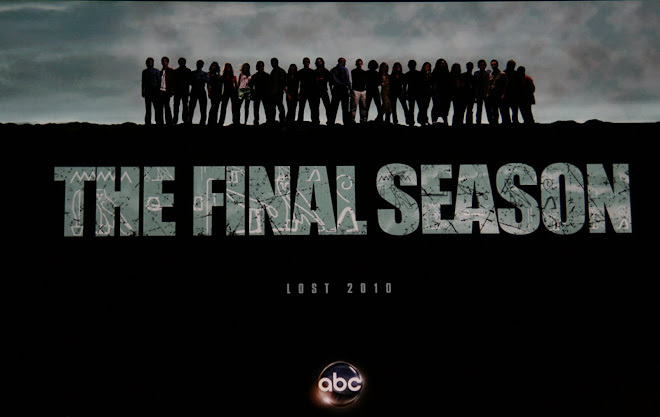 So I wonder which one behind attacking Sayid and Hurley? That didn't happen until Locke died. And since we know how Locke died now (getting there) that might add some weight to things. Widmore explains that it is necessary for John to be back on the Island (he may have been referring to them all). Locke also mentions to Widmore that Richard told him he was going to die. Widmore promises that he won't let that happen. A War is coming, and the wrong side will win if he's not there. Woa....is it a Ben vs. Charles war? Or something else entirely? It is important to note that everyone Ben, Charles, Richard keep telling Locke how special he is. I really hope all this "SPECIAL" talk pays off in the end! We all knew that Neo was The Chosen One expected for great things in The Matrix. But then....the 2 sequels happened! I'm getting sidetracked. SOMEONE is lying right? Ben or Widmore. They both present very convincing cases. Even with the fake flight 815 plane crash both cases are convincing. Maybe BOTH of them are lying. Here's where I get a little confused with Widmore's story. He claims that he thinks Ben may have convinced Locke to turn the wheel. Yet Widmore has SEEN Ben off of the Island. Ben came to visit him in October of 2005 claiming he's going to kill Penny. So would Widmore really have assumed that Ben returned to the Island since then? Ahh interesting stuff but we can only speculate for now. We should also note that with the "EXIT" being in Tunisia, we can assume that Ben has left the Island via Donkey Wheel before which explains why Ben had stayed at the hotel in Tunisia before. This may explain all of the passports and foreign currency. Hmmm, so if he's left before I guess that means he has been able to get back before too. 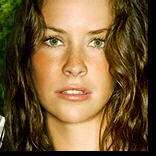 But Widmore knows Ben is after his daughter and wouldn't return to the Island until that job was done. (or attempted to be done!) Have I mentioned I'm still confused?! Later on we find out Widmore is the one that supplied Locke with the name Jeremy Bentham an English philosopher. It was a good time when he mentioned John Locke's parents had a sense of humor naming him, so why couldn't he too! Okay, so the passport says he is Canadian but born in New York. I almost just cried fowl on the producers because I didn't see the New York piece! We knew that the obituary mentioned New York. So job well done writers! Big reveal here also. Matthew Abbadon is an employee of Charles Widmore! Which makes sense since we saw him giving the tasks to the Freighter 4 last season. 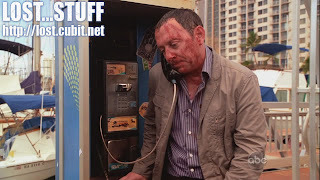 I guess we still had speculations to whether those 4 were tied to the Mercenaries (Keamy and crew). Well, now we know it was all funded by Widmore. We also know that Locke and Abbadon met in the past but Locke pretends to not know him at this point. Abbadon is going to "get Locke to wherever he needs to go." And he supplies a Wheelchair. ouch. Sorry Locke! Widmore supplies the known whereabouts of all the people that left the Island and they are off to the airport. Also an emergency cell phone that if you dial 2, 3 (23!) Locke can contact him. First up....Santo Domingo and Sayid! Abbadon claims he can find anyone for Locke that he wants to find (past family members, etc...). Locke ignores him for now and just tells him to drive. 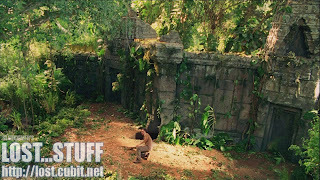 Sayid seems to be working for a Habitat for Humanity type project (called "Build Our World). It looks like he is helping build a school. He seems to be REPENTING for past sins. Locke comes to visit him in wheelchair and all. Sayid is not sold on Locke convincing him to go back. He explains for 2 years he was manipulated by Ben into believing he was protecting everyone on the Island. He asks who is manipulating John. John claims no one, but I guess we just don't know! Locke explains to Sayid that if he changes his mind he is staying in L.A. as Jeremy Bentham in L.A. at the Westerfield Hotel. Locke and Abbadon are parked outside of a School waiting for WAAAAAAAAAALT! Locke mentions that he wants Abbadon to find his old squeeze Helen Norwood. Walt comes out of the school. Abbadon says "So that's Michael Dawson's son? The boy has gotten big!" clearly indicating that he's been keeping tabs on these people for some time! Walt knew that Locke was in a wheelchair before but he asks what happened. Locke just mentions he hurt his leg. Walt says he's been having dreams about Locke. He was on the Island, wearing a suit and there were people all around him. They wanted to hurt him. Hmmmm our Ajira folk? This makes me think, what if Walt dreamed about Locke the day he was shot by Ben which is how he appeared to him and appeared to be older? Same with when he appeared to Shannon and Sayid in season 2? We know Walt has some crazy telekenetic ability, maybe it's through dreams too or something? Eh, still too open ended right now but thought I'd throw that out there! Walt asks about his Dad. If he's at the Island. He hasn't talked to him in 3 years. Locke just says last he heard Michael was on a freighter near the Island. I guess he didn't have the heart to tell him that he died. And then didn't have the heart to ask him to come back to the Island. Locke changes his mind and just tells him he stopped by to make sure he was okay. 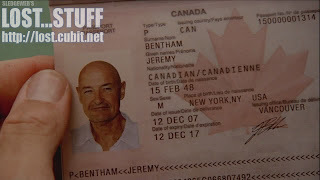 Note that he never mentioned the name Jeremy Bentham, but Walt told Hurley that Jeremy Bentham came to see him. I guess I shouldn't look much into it, but come on! Abbadon tells Locke he's 0 for 2 and starts taunting Locke about failing his mission. Locke claims Walt has been through enough. Locke says he only needs to convince one and if he can do that, the rest will come. I'll bet he never thought Jack would be that one! We also note here that creepy Ben is watching them. uh oh! Hurley is drawing a picture of what appears to be the Sphinx. Look into it as much as you want. Locke was in the desert, Hurley is drawing the desert. Eh, this isn't Heroes! I'd like to think Hurley isn't a Pre-Cog or whatever they call Isaac the Painter and his subsequent future painters! Hurley thinks Locke is a ghost because he's been visited by many of them. He figures Locke didn't make it on the Island. He then asks around if he is talking to anyone. Funny that he asked because one of the crazies pointed right at Charlie last season! But he then believed Locke was alive. Abbadon ups the tally to 3 failed visits. And he finally breaks the tension around their pre-Island meeting. Abbadon is the man that pushed Locke around in the rehab facility in the wheel chair and told him to go on a Walkabout. It was Abbadon who got Locke on flight 815. "I help people get to where they need to get to." 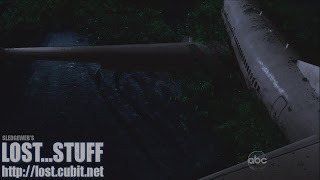 So did Widmore know where flight 815 was going? I had a theory way back in season 1 that everyone on that Island was recruited for some purpose on the Island. Maybe not everyone, but at least the ones we came to know over the seasons. Was Widmore behind getting those people on the plane? Crazy crazy stuff. More to come I'm sure on this! Ahh the most EXCITING trip of the episode (sarcasm). Locke visits Kate. Kate essentially asks Locke about his love life and says he has no one which is why he never wanted to leave the Island. Locke talks about Helen but then how he ruined the relationship because he was angry and obsessive (good ol' Daddy issues!) Kate makes it worse by telling Locke he really hasn't come far from then! Kate is a no go! Locke asks Abbadon about Helen again. And while Abbadon was reluctant he takes him to her. Abbadon starts talking about fate and how her path ended here and how Locke's path leads back to the Island. Locke begins to even doubt fate asking how he can say it like it's inevitable. Abbadon mentions that Richard says Locke is going to die, is that really a choice? Hmm, so that reminds me. I wonder if resurrected Locke in the future tells Richard what happens and THAT version of Richard is the one that runs into Locke from the past and tells him that he has to die? That would make sense since Richard knows the Oceanic 6 are alive off of the Island at the time too. I guess we already figured this one out, but worth bringing up again! Locke races off in the car and gets slammed in an intersection by 2 cars. Ouch! No fear, when Locke wakes up he has a visitor waiting for HIM! It's bearded Jack! (but we must note the beard is not as crazy as it gets. A period of time must pass between this scene and the Hotel scene. Jack is not buying it. It's more of this DESTINY/FATE talk from Locke. Locke has renewed faith in seeing Jack. He was brought to Jack's hospital, they were supposed to have this encounter. Jack says it's probability not fate and based on where the accident was. Locke says it was no accident, someone is trying to kill him. (Jack assumed Locke was murdered probably by this comment. I guess his assumption wasn't very wrong!) Locke says that they don't want him to succeed. They don't want him to get back because he is important. Jack puts the final nail in the coffin on lonliness. Tells Locke that his delusions of being special and important are not real. Maybe he is just a lonely old man that crashed on an Island. I still don't get why Locke would never tell anyone that he was paralyzed. Maybe they wouldn't believe him? I dunno. Rose saw him in a wheelchair! He finally told Sawyer, but naturally everyone was too busy for him to ever tell anyone else. 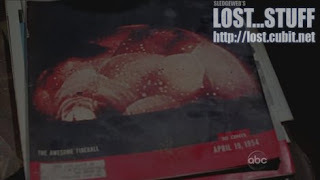 Just another example of no one telling people information on LOST! Jack just loses it. He goes on his whole MY FATHER IS DEAD! Rant. Disregarding the fact that he has seen Christian on the Island. Locke helped him hunt down his White Rabbit in season 1. He knows Christian is Claire's father and all the crazy stuff going on on the Island. But denies that anything Locke is saying can be real. Locke explains that Christian told him to move the Island and how to bring them all back. Locke said that he didn't look dead to him. Jack mentions how he put him in the coffin. We can now tie this back to last week's episode when he knows Locke was dead and going to the Island. We can only imagine what Jack is tying together in his head. Locke says Jack is the only one that can convince the rest of them. That he is supposed to help him. Jack says It's OVER! It's done. We left and we were never important. You can still sense a hint of Jack's regret in that statement. He asks Locke to leave him and the rest of them alone. Oh boy....if that venture through his prior acquaintences doesn't make you feel alone and wanting to put an end to things....well I dunno! I say undisclosed time because of the information provided in this scene and the size of Jack's beard! We'll discuss in more detail in the bullets. We see Locke write the now infamous suicide note that we saw in last week's episode. Probably another reason they decided to air "316" before this episode. 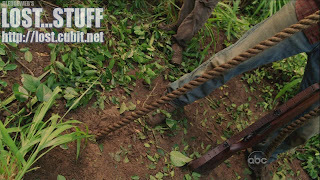 Locke pulls out what looks like WIRE (not rope) and begins to make his noose. Cuts out some of the ceiling, hangs the wire and puts the loop around his neck. It really seems like Locke WANTS to kill himself and not because he's doing it out of fate. Just as he's about to jump off the table......KNOCK KNOCK! 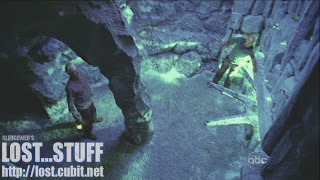 Ben breaks through the door. He urges John to reconsider. Locke claims he's a failure. He couldn't get anyone to believe me. Ben talks about how important John is. How SPECIAL he is. He talks about how John has TOO MUCH WORK TO DO (a common theme in these later sesons). He admits to killing Abbadon before he killed Locke. He goes on the whole rant that Widmore is the bad one. He's the reason he moved the Island so Locke could lead. Again, we're getting 2 stories. He admits to watching all of the Oceanic 6 and keeping them safe. But we're not sure who has been the THREAT to the Oceanic 6. Ben informs Locke that he DID suceed. Jack booked a plane ticket to Sydney. Whatever Locke said to him worked. Okay, so was Jack returning from Sydney in the Season 3 flash forward? He told Kate he's been flying A LOT. And he mentions a few locations and all of them were attempts to get back to the Island. And like I said...his beard was a LOT longer and Jack was a lot more drunk and much more drugged! And he reads the obituary on the plane ride back. If Locke's body was in a hotel room, I'm sure they found him pretty soon after! Locke comes out of the noose begins to cry. Ben talks about how he hasn't talked to Sun yet. And Locke reveals that Jin is alive (BINGO! The missing piece!). He told Ben he promised not to go to Sun and would not bring her back to the Island. Ben says a promise is a promise. Locke then explains that he knows what has to be done. He has to go talk to Eloise Hawking once he gets them all together. and BAM.....Ben looks at Locke. WHAT did you say? Ben says he knows her. But something very shady is going on. Maybe he knows that Charles Widmore knows her. Maybe he also exiled Ellie back in the day too. But does he know that it's Daniel Faraday's mother before Desmond reveals it? Maybe he knows if Jacob or Christian who speaks for Jacob mentions Eloise Hawking, he now knows that Jacob is against Ben which means Locke is against Ben. Or maybe he now has the missing piece of information which is why he was keeping Locke alive. Or MAYBE he knows that Locke has to die based on the information provided. Lots of MAYBES! But one thing is for sure, as many suspected, Benjamen Linus killed Jeremy Bentham (aka John Locke) with the rope (wire) in the Hotel room. (Ahhh I miss Clue. Good thing they're making a new movie!) He strangled him almost immediately after he mentioned Eloise's name. After he cleaned up the crime scene and made it look like a suicide, he must've grabbed Jin's wedding ring and left the room. Before he left though he seemed to sincerely say "I'll miss you John. I really will." Well HUH???? I mean, now we're back to assuming Ben is the big bad guy right? But many of us believe that Ben will be redeemed when everything is said and done. That all of his actions will be for a reason. Tough to see right now. He just KILLED Matthew Abbadon AND John Locke! And he MIGHT have killed Penny. How could he possibly be good? But we still see Widmore potentially lying to Locke too. Lots of questions! But for now, a very dramatic finish to the life of Jeremy Bentham. Locke comes into the Hydra office where Caesar is reading up on some stuff. He explains that he had been on the Island for 100 days at some time in the past. And that an organization called DHARMA used to do experimentations here. He explains the timing of it all will confuse Caesar. Locke claims to know how they got back. He asks for the manifest (which he asked Ilana for earlier. I forgot to mention!) . Caesar doesn't have it. He asks if everyone on the plane besides those that disappeared are accounted for. Caesar says yes. And everyone survived but there are some people that are hurt. Locke walks past a few of the hurt passengers and stumbles upon BEN Last! All bloodied up (could still be from his before-island encounter). Caesar asked if Locke knew him. Locke said that he is the one who killed him. Whew, that is one long night and day of blogging folks! But totally worth it. Hopefully, I cleared things up as much as I confused things further! (always my goal!) I hope you enjoyed my ramblings. I think I have tons more questions, but I will save them for the comments! 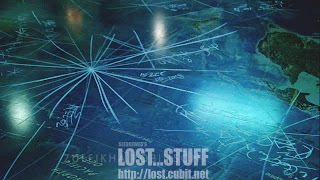 If discussion on this blog isn't enough to get your LOST fix, I will be also posting the blog at lost.gather.com for a new audience. Feel free to come over and check it out there too! Hope you enjoyed my ramblings and see you next week! And NAMASTE! 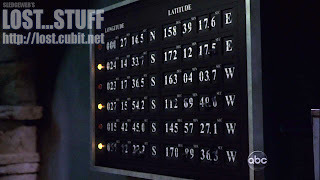 As always, thanks to lost.cubit.net for always providing fantastic screenshots after each episode.